People always ask me if there are any books that I can recommend. Finally there is one. 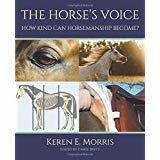 Written By Keren Morris and edited by Carol Brett from the BALANCE organisation (Carol Brett was one of the developers of the BALANCE saddles and one of my mentors). This book has the best and most correct explanation of posture and biomechanics that I have seen published. A lot of what is out there is not quite right. Through correctly understanding posture and biomechanics we can make the whole experience of riding feel so much better for the horses as well as for ourselves. The more we understand about this, the more we can understand why horses have resistance and reluctance in being ridden when they are ridden in badly fitting saddles and with incorrect riding dynamics and disengaged postural states. I would highly recommend all my students to read the book – it will a great resource for you. Teaching about posture and biomechanics has for a long time been of huge importance to me and a priority in my teaching and this year I am making it even more so by offering a new ground work course “Postural Development, Biomechanics and Rehabilitation Ground Work Therapy”. There will also be a support program through video coaching to help people even more in this area because there is such a great need for more education and support here. You can purchase the book from www.amazon.com.au and I will also have copies available for sale.